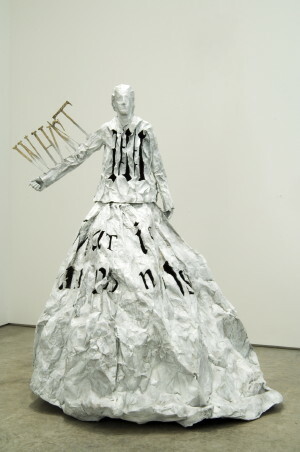 Click Guest Posts tab to read about Nancy’s visit to Lesley Dill’s traveling exhibition. FINA, the international governing body of swimming, has banned performance-enhancing “non-textile” swimsuits as of January 1, 2010, but has tabled the determination of “what is a textile?” until later this Fall. High-tech suits made of 50% polyurethane were first worn in world competition in 2008. A second generation of the suits, made of 100% polyurethane, appeared after the summer Olympics. The material is thought to compress muscle, add extra buoyancy and provide more forward propulsion. More than 130 short- and long-course world records have been broken since swimmers started sporting the super suits. In fact, only two of the current world records were set before their introduction. Record-breaking is likely to slow once the ban is in place. Accordingly, some in the swimming community support a proposal to place an asterisk next to the world records set in polyurethane suits to distinguish records set before and after the suits were prohibited. 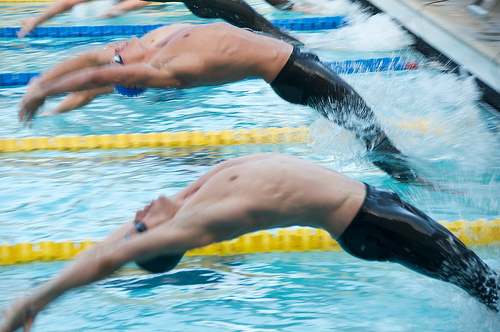 FINA has some fine-tuning ahead. Its ruling says that only “allowable textiles” will be permitted, but that term has not been defined. 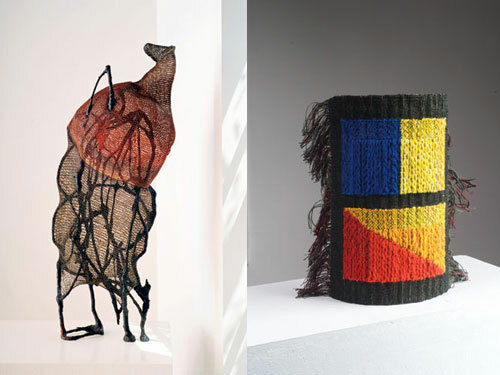 In the art world, the definition of “textile” is quite expansive. Polyurethane would certainly be included if it was braided or plaited or woven or the like. According to WiseGEEK, “polyurethane is an incredibly resilient, flexible, and durable manufactured material that can take the place of paint, cotton, rubber, metal, and wood in thousands of applications across all fields.” Like tyvek®, mylar, fiber optic and stainless steel threads, it sounds like a promising material for artistic exploration — if not for athletic competition. Here’s your chance: Do you have any advice for FINA on crafting its definition of “allowable textiles”? Let us know. Can textiles save lives? According to health experts, fabric can play a major role. All you need do is sneeze or cough into your sleeve. When you do, mucus droplets laden with disease-causing organisms are released into fabric where they soon dry and any microorganisms die or become inert. Reportedly, the flu virus can last up to 48 hours on impenetrable surfaces like plastic but survives a shorter time on porous surfaces like paper or cloth. In addition, when you practice what’s now known as “the Dracula sneeze,” microorganisms don’t wind up on your hands, and so aren’t transferred on to telephones, doorknobs, eyes, nose, or mouths. Speaking of fashion, you’ll find ideas for coping with the H1N1 outbreak wth style online, at flufashion.net which offers N95 respirator facemasks in bandana-style or animal prints. There are also shots on the internet of those who’ve chosen to style their own surgical masks. The CDC says facemasks and respirators are generally not recommended in community and home settings, except possibly for persons at increased risk of severe illness from flu or who are in crowded community settings where the flu has been diagnosed. If you fall into one of those groups, though, you’ve now got fashion options. 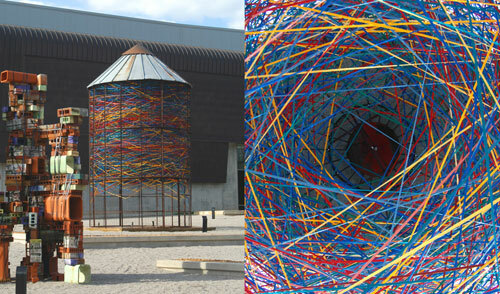 This installation, Woven Corncrib, is part of the Western Michigan University (Kalamazoo) Sculpture Tour. National and international artists are commissioned to create and install work on the campus for two years. 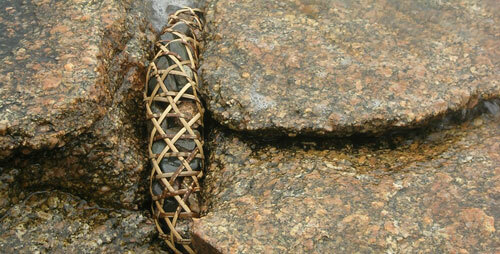 It was originally installed in Falcon Heights, Minnesota from 2004-9, using remnants of marine rope of various types. At WMU it was completely rewoven with a flat braid of 100% solution-dyed acrylic. The weaving process took two weeks of solid work. Although the installation will be up for two years, the braid material is expected to last much longer in terms of both color-fastness and material degradation. Woven Corncrib, Western Michigan University, Kalamazoo, Michigan, photos courtesy of Randy Walker. The Museum of Arts and Design in New York has rotated new works into Permanently MAD: Revealing the Collection, which traces the phenomenal rise of the studio craft tradition in America following World War II. The new additions include Floater IV, by Norma Minkowitz and Front Pages by Helena Hernmarck. Go see the new work. Here are images other works by Norma and Helena to whet your appetite.